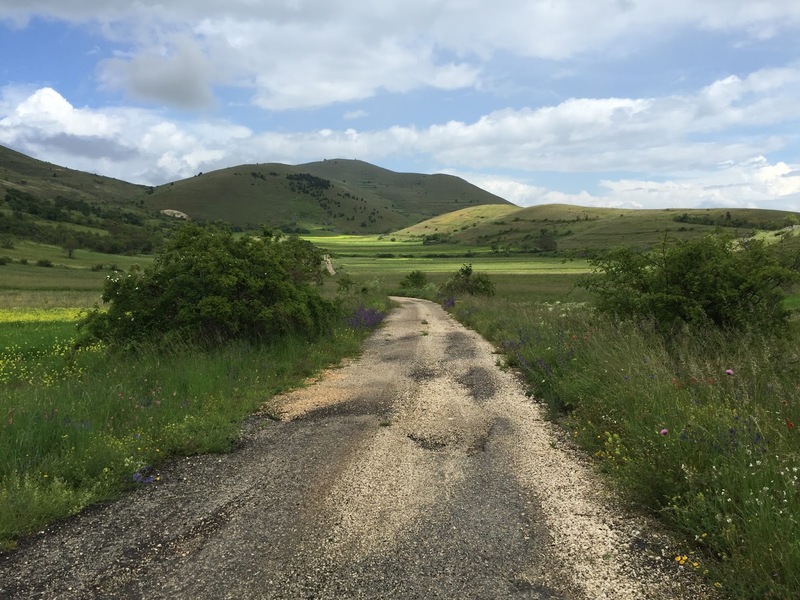 Of Italy’s 20 regions, Abruzzo is one of the three we hadn’t visited. (Calabria and Marche are the other two.) 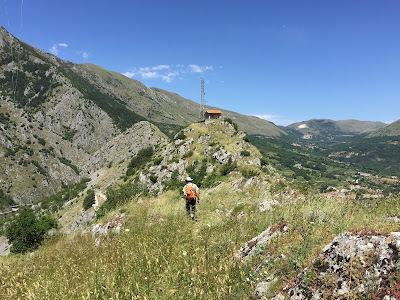 We decided to see a little of Abruzzo and try some late spring, early summer hiking there. 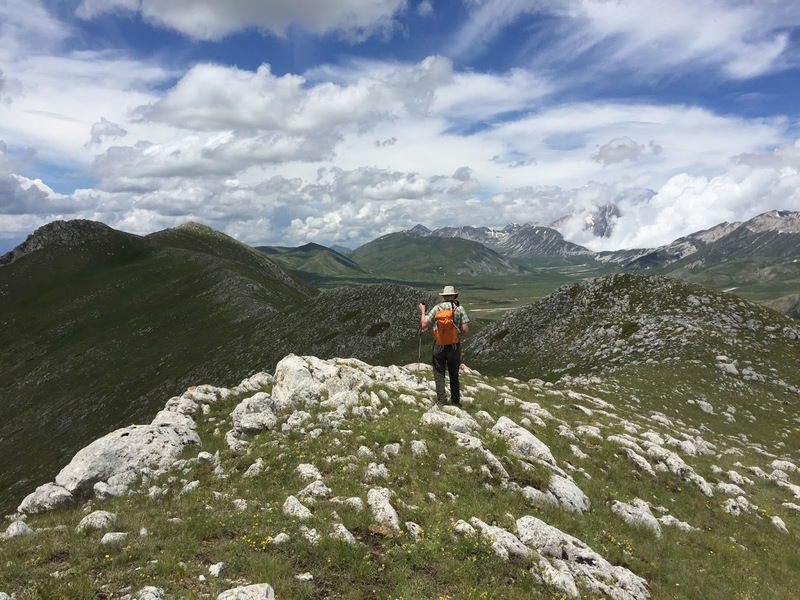 We opted to spend the bulk of our 5 days and 4 nights in Gran Sasso National Park. It goes without saying that we could have easily stayed longer and explored more. 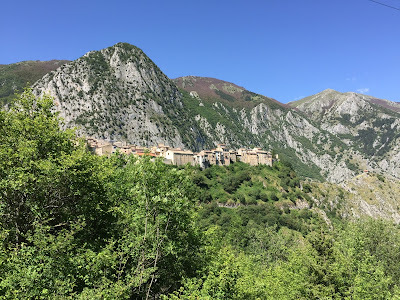 For the short period of time there we were able to see a number of I borghi più belli d'Italia, including Santo Stefano di Sessanio, Castel del Monte, Pacentro, Anversa degli Abruzzi, Villalago, and Scanno. One of the most fascinating places we visited was the single frazione of Anversa degli Abruzzi called Castrovalva. Escher made a lithograph including a view of the village in 1929. The hike details are below. We had 4 days of walking / hiking and hit 47 km total. 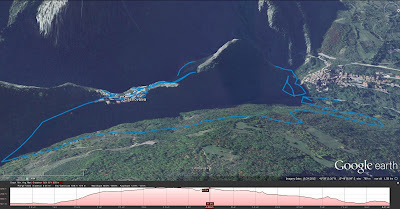 The satellite imagery of different mapping sites (Google, Bing, etc. ), depicts Abruzzo as brown and bleak. It's likely they take most of the photos in summer and autumn when conditions are the clearest and ground conditions are the driest. At any rate, we found it surprisingly green and lush, which lead to some very pleasant hiking in and around fields of green grass and flowers like we’ve never seen before. 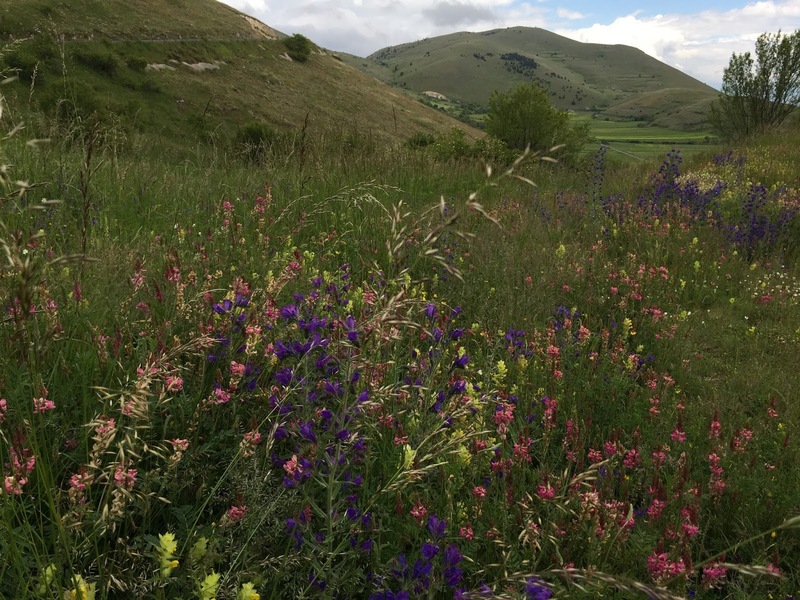 The owner of La Bifora e Le Lune (see Lodging below), said that a good amount of rain in the previous weeks was responsible for the abundance of flowers. We were struck by how many herbs you see are used to decorate houses, are in cooking, and in general as a part of everyday life, at least in the areas we visited in Gran Sasso. 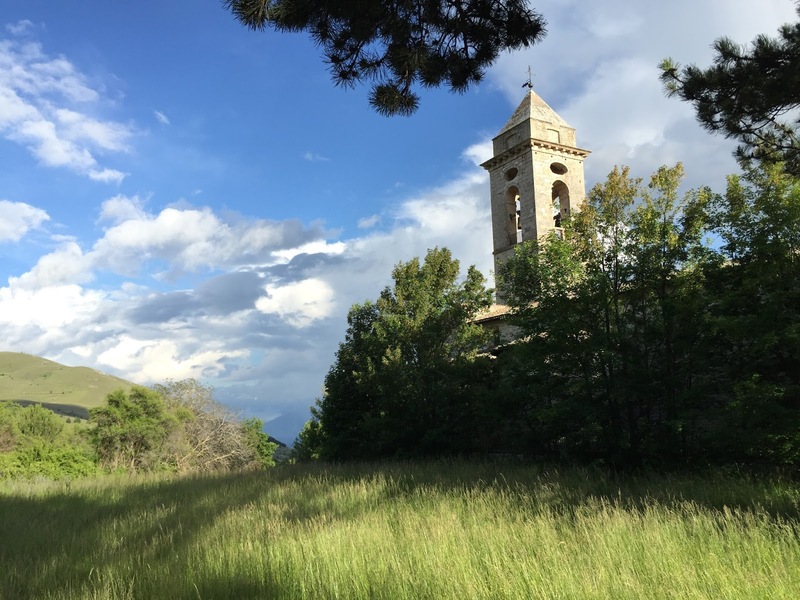 The town of Santo Stefano, though small, is a place you can easily get lost in. Streets (more like small lanes) twist and turn, and duck in and out of buildings. Dead ends and staircases lead to nowhere. It took us several days to start to figure out the town. All in all, very pleasant. Note that the town is under serious reconstruction with scaffolding (some quite beautiful to look at) supporting structures so they don’t crumble from the damage of the 2009 L’Aquila earthquake. 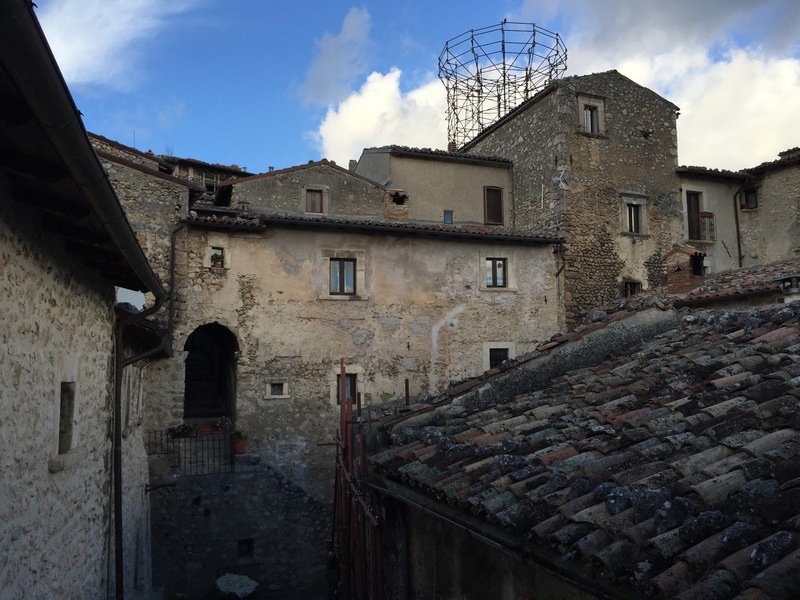 In fact, the main tower in Santo Stefano is mocked up in scaffolding, the only indication of where it once stood. We got sprinkled on once, but otherwise the weather was good. We were always treated with interesting cloud formations. Clouds seemed to come and go very quickly, especially around Corno Grande where we spent one-day hiking. We broke our “rule” of staying at one place for one night due to flight schedules. That is, we stayed 3 nights in Santo Stefano di Sessanio and only 1 night in Sulmona. 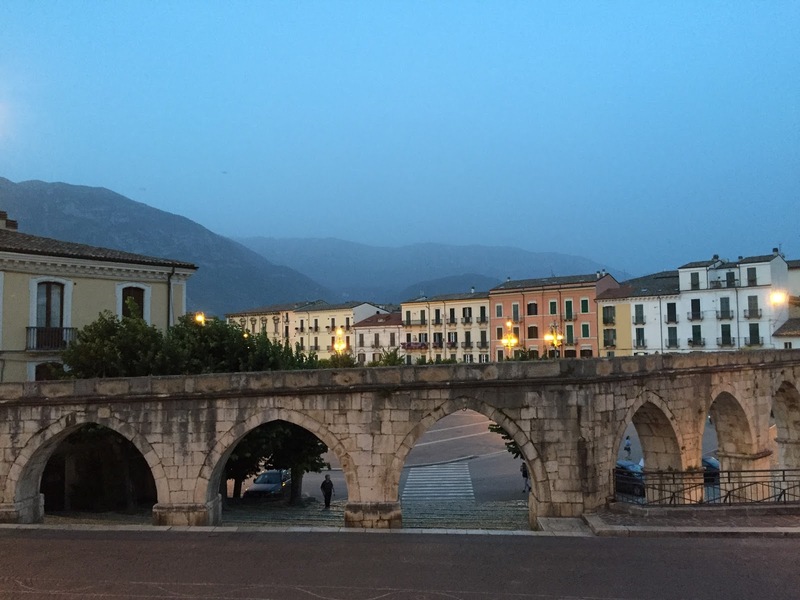 We would have liked at least 2 nights if not 3 in Sulmona. 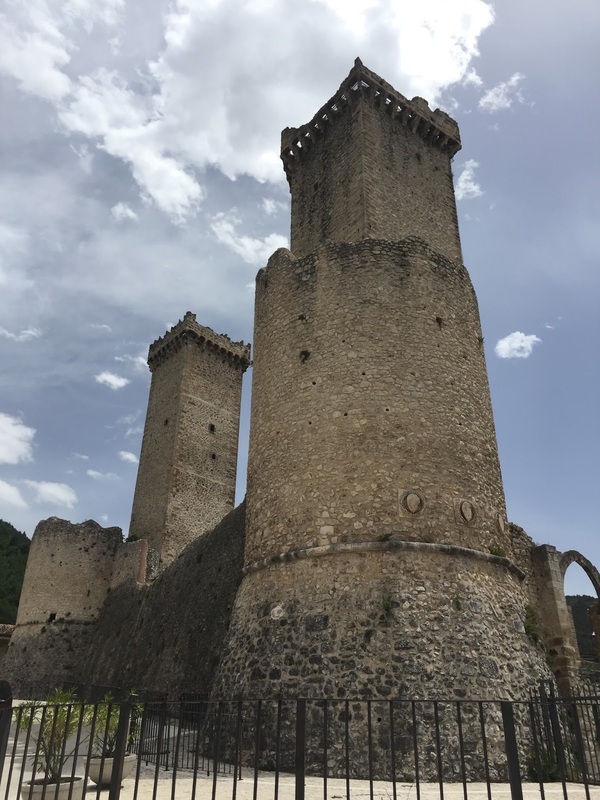 We took Ryanair flights between Bergamo and Pescara and rented a car at the Pescara airport (easy) and drove about an hour to reach Santo Stefano di Sessanio, our first base of operation. Overall, we put on 450 km on our cute Alfa Romeo Giulia rental. To see the I borghi più belli d'Italia, you really do need a car. 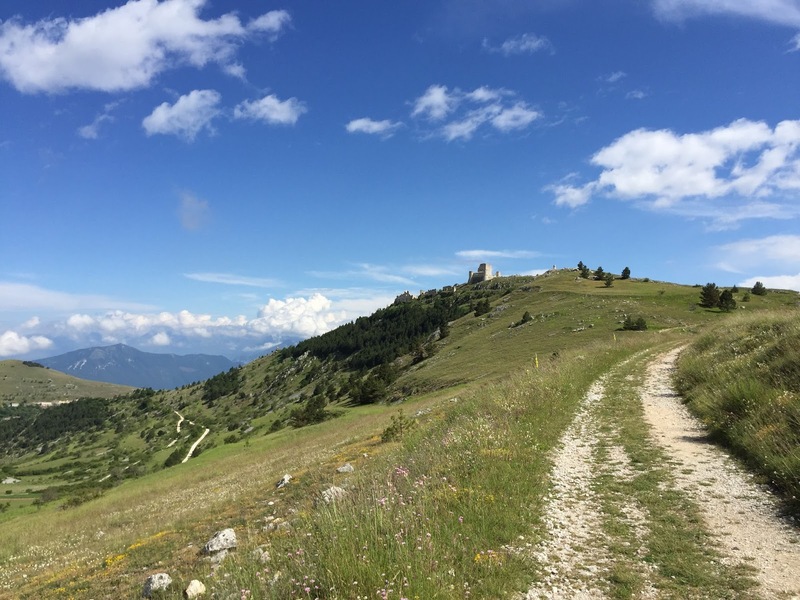 In my opinion, Italian hiking trails can change quickly. 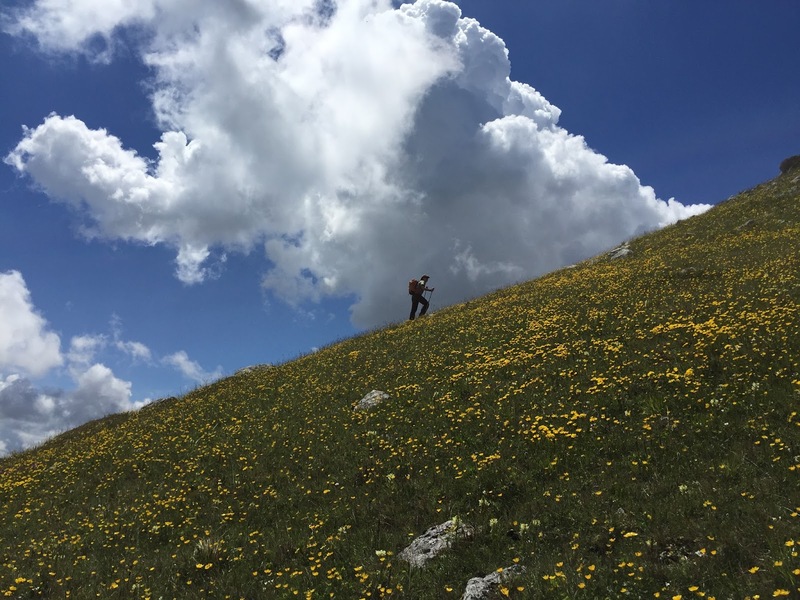 Conditions can go from flat and easy to steep and hard in the space of a few feet. Sometimes, trails can be poorly or confusingly marked. Do your research ahead of time. We stayed at La Bifora e Le Lune run by the humble and kind Mirella. 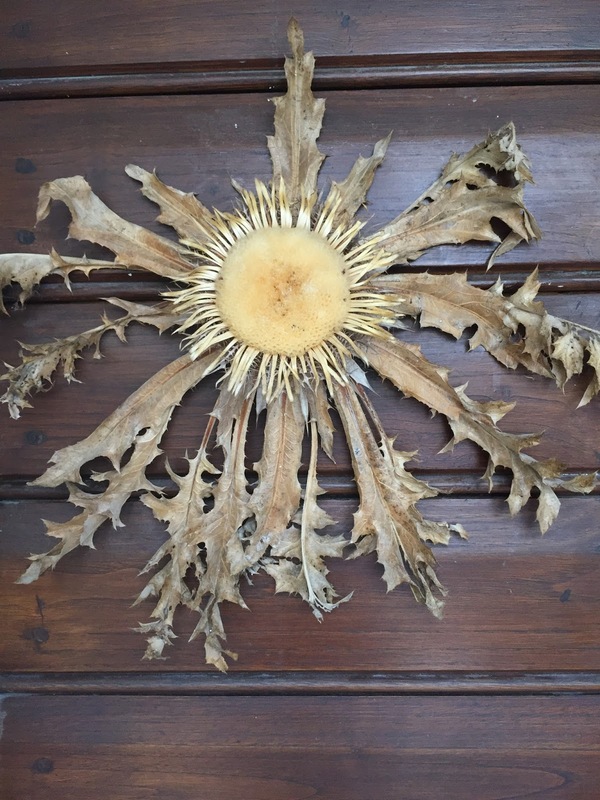 She is a great resource for anything local and botanical. She is obviously proud of her home and town and is eager to share. The name of the B&B refers to the mullioned windows (bifore) in the main salon, a connection to the Florentine family that once owned the structure. It’s a small B&B that attracts interesting people. Mirella mentioned that she leads a walk focusing on herbs and plants every May. We may check it out next year. 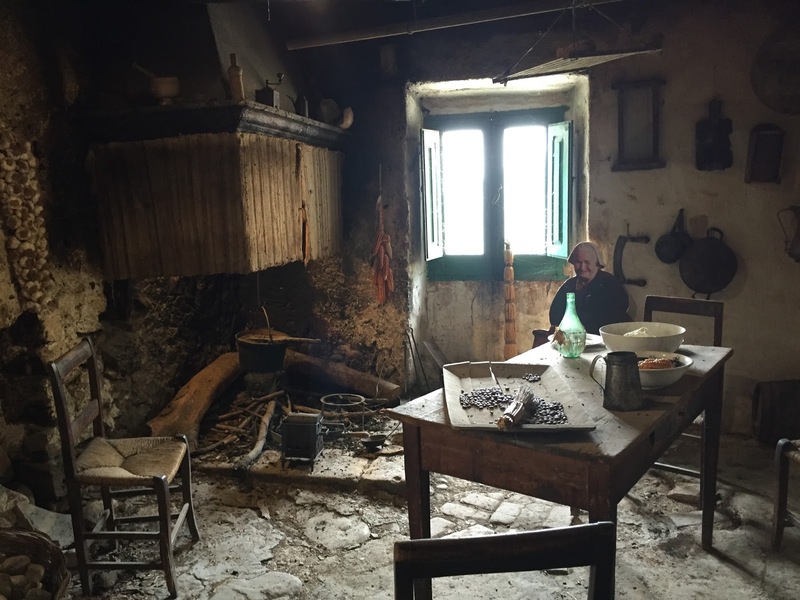 We ate at La Bettola di Geppeto (in Santo Stefano) twice. At La Bettola you get regional flavors, in simple presentations, and for reasonable prices such as Zuppa di lenticchie and arrosticini. We ate at Bettola once for lunch on the day we arrived in Santo Stefano and on the second day of hiking for dinner when we were too tired to think about other options. On the third day of hiking, we decided we needed a little Slow Food lovin’ and cast our net a little wider to find Sapori di Campagna in Ofena, just down the road from Santo Stefano. Sapori di Compagna also features regional flavors, but with a uptick in elegance and preparation of dishes. 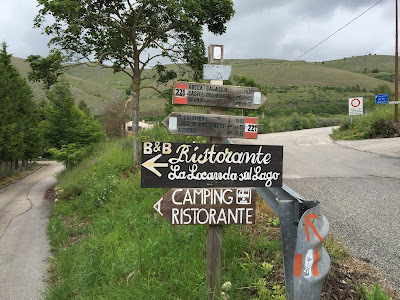 We used the indispensable Osterie d’Italia Guida (Slow Food) guide to find it. 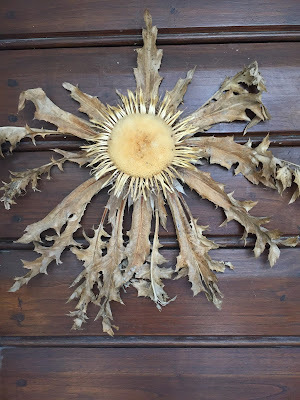 Far Left: Dried Carlina decorates the door of La Bifora e Le Lune. 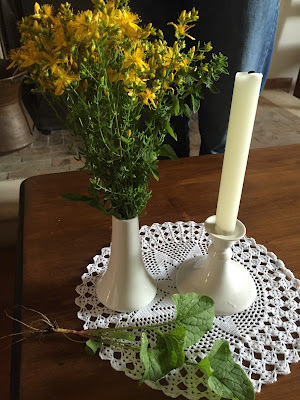 Center Left: Talking plants with the owner of La Bifora e Le Lune, St. Johnswort and Wild Spinach; Center Right: View of Santo Stefano di Sessanio Tower Scaffolding; Far Right: Church bell tower on the edge of Santo Stefano. We stayed at the family run Hotel Rojan (the word Rojan is a combination of some of the family members’ initials). We encountered Gianluca (one of the owners) and he was full of great advice and knowledge of the local area. Ask him for advice and you’ll likely get a hand-drawn map (of very good quality). I wish we had time to stay more than one night. Lunch Taverna de li Caldora (Pacentro). On our change of lodging from Santo Stefano di Sessanio to Sulmona we were a bit tired from 4 days of hiking (1 in Bergamo, 3 in Gran Sasso) and needed a rest. 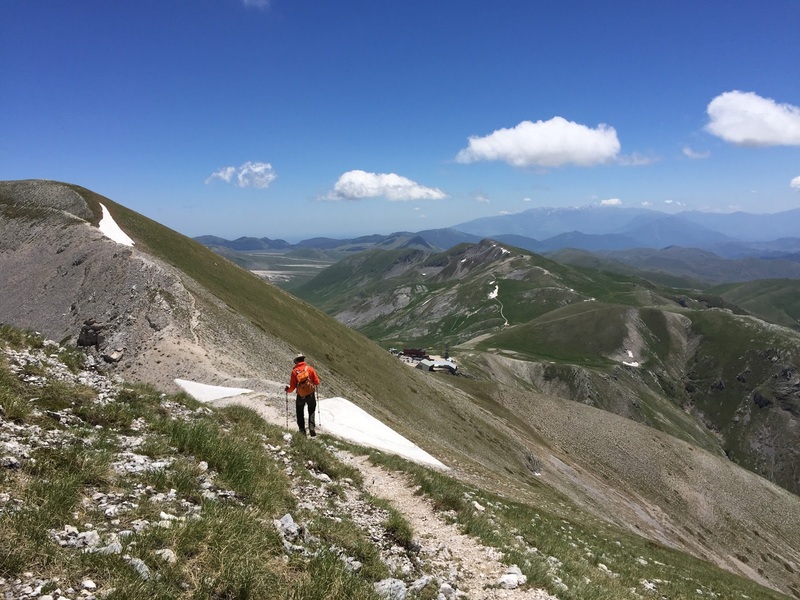 Also, it was a day with a sirocco (scirocco in Italian) so we decided to bag hiking and explore Pacentro. 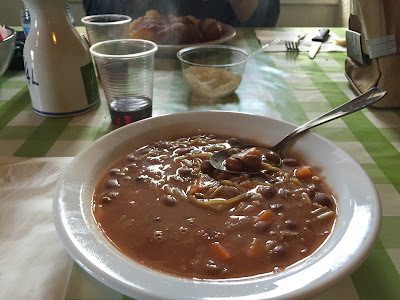 The real motive was to eat at Taverna de li Caldora, another Osterie d’Italia Guida (Slow Food) recommendation. It was delicious and a perfect choice. We loved all the small dishes they threw our way as part of their antipasto. They idea is if you are still full after the antipasto, you have a few choices for a primo (pasta) or secondo (meat). We went for a tris of pasta. 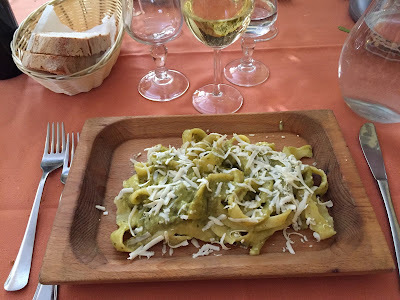 Lunch at La Facciola (Anversa degli Abruzzi). We just finished a hike from Anversa to Castrovalva and back and were a little peckish. We walked into town and just a little past the main square to find La Facciola. With a Euro Soccer game on lightly in the background along with a little Queen coming from the kitchen, we had a perfect lunch. Try the mungaia con crema di zolle e scaglie di ricotta affumicata – a local pasta dish (see photo below). We finished with the local desert, pan dell’orso. 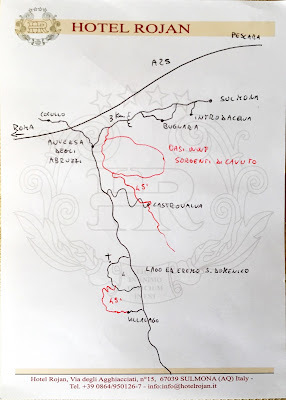 Far Left: Pacentro's Castello dei Cantelmo-Caldora; Center Left: Pacentro anthropological site - Casa di "Marlurita"; Center Right: Sulmona aqueduct; Far Right: Custom map from Hotel Rojan! A car for getting around; needless to say, it would be very hard to see the small villages relying on bus. 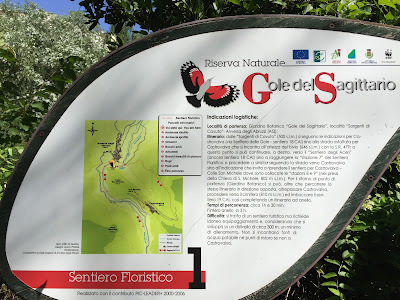 Picking Santo Stefano as a base was good for the hikes we did. We never drove for more than 30-40 minutes to get to our day’s hike starting point. 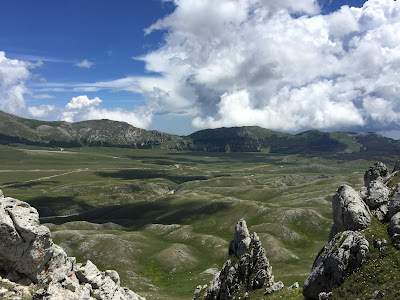 One of our hikes (warm up) was the classic walk from Santo Stefano di Sessani to Rocca Calascio. 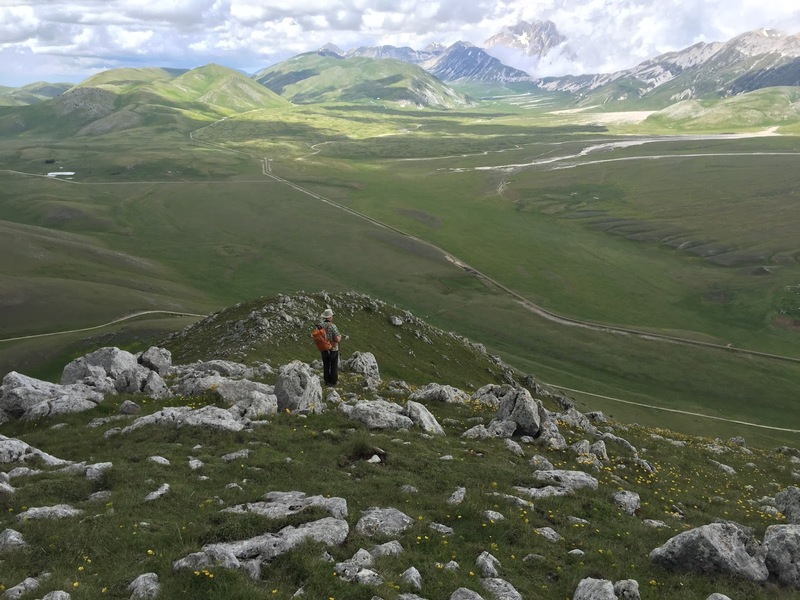 Gran Sasso is special place. 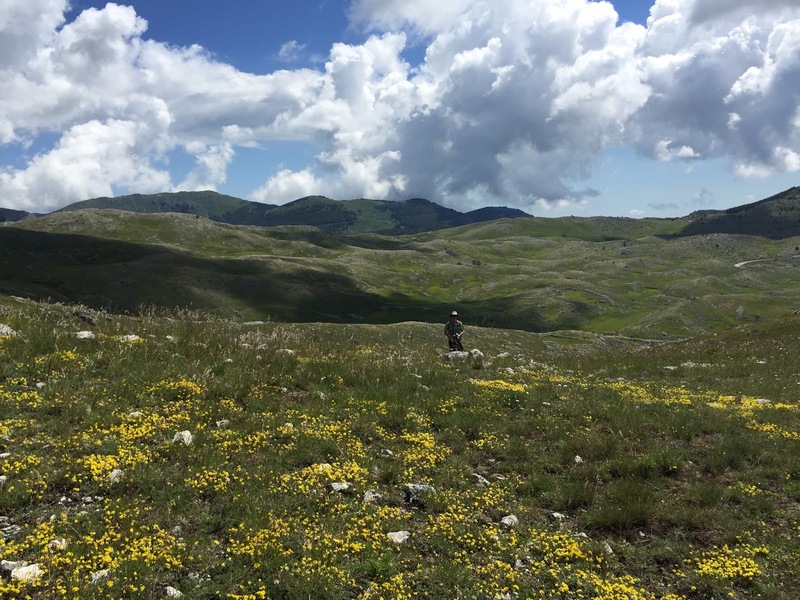 The Campo Imperatore area and the plane stretch east to west is gorgeous. 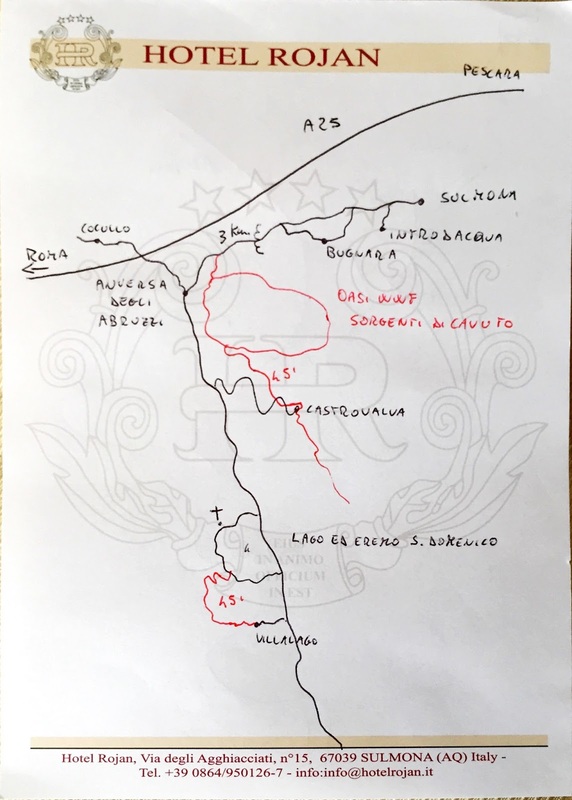 The Strada Statale SS17bis runs through the area. Dressing and being prepared for all conditions, especially in higher elevation hikes like around Corno Grande. While we had good weather, it was very windy and we were glad for decent technical wear and gloves at times. We didn’t spend any time in Parco Majella. At least a day there hiking would have been nice. We were bad about planning around trails. 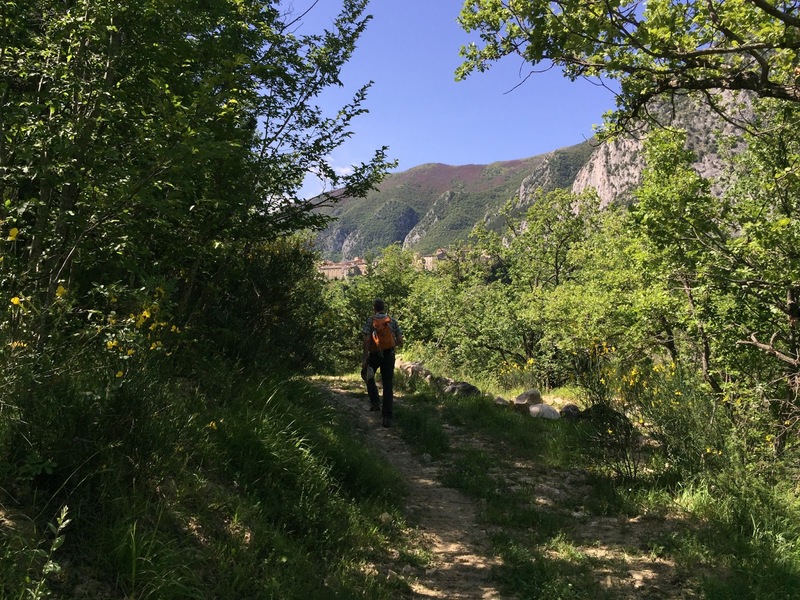 A few times we were weren’t sure of the trail numbers (especially around Monte Bolza) or where the trail was exactly. 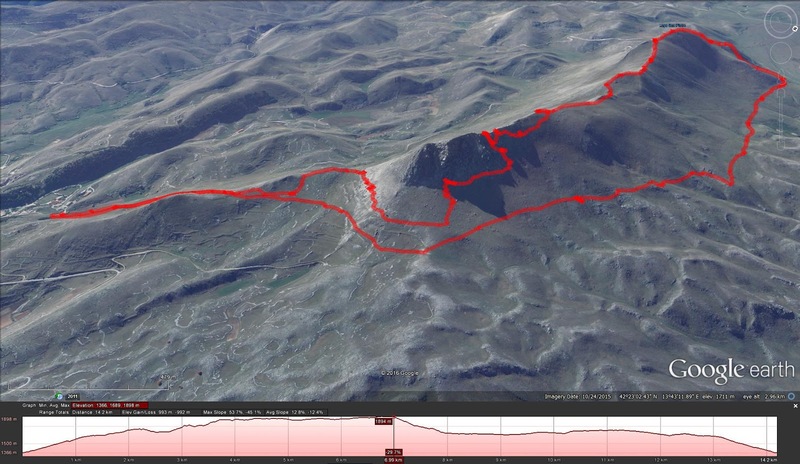 Some of that was due to last minute planning and some due to the fact that the trails just weren’t well marked. More thorough planning would have helped. Go on a tour of the Laboratori Nazionali del Gran Sasso to see what exactly is going on under Gran Sasso. 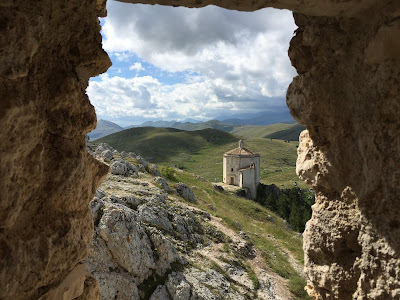 Views of the Santo Stefano, Rocca Calascio hike. 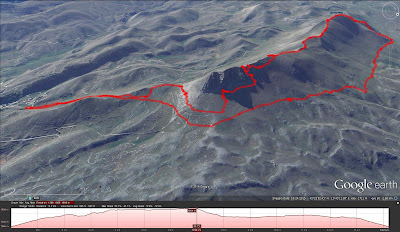 This is a classic town to town hike that was very satisfying. We followed WALK 10 Santo Stefano and Rocca Calascio [Haines, Stuart; Walking in Abruzzo (Cicerone Guides)]. 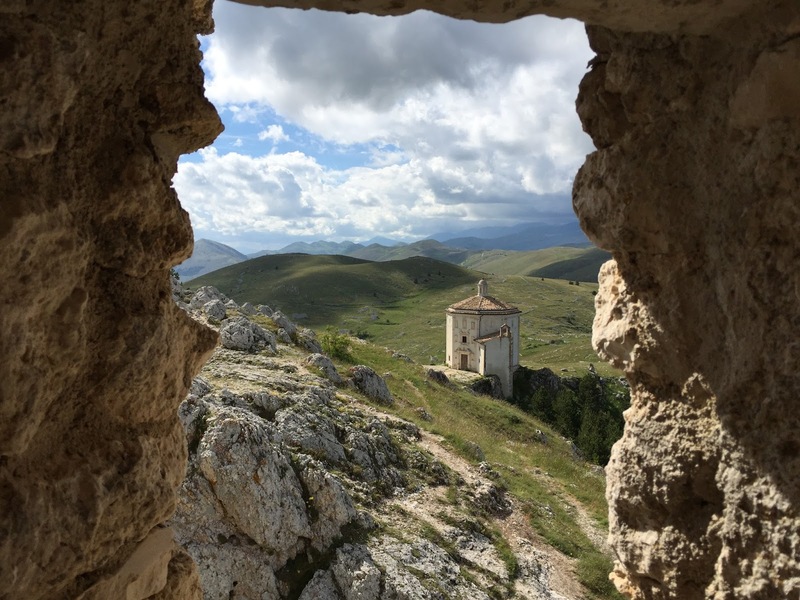 The Rocca Calascio is a magical place. Make sure you walk past it, toward the parking lot, and down the hill to find some refreshments at Il Rifugio della Rocca. From the castle ruins, you can’t even see the old town. 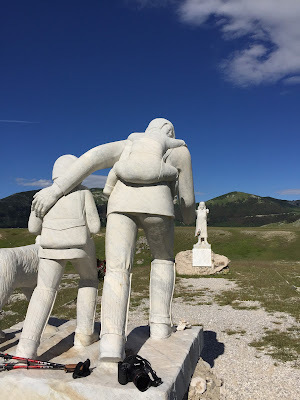 The modern town of Rocca Calascio is even further down the hill. For more photos from this day see Santo Stefano di Sessanio: A Day of Color. 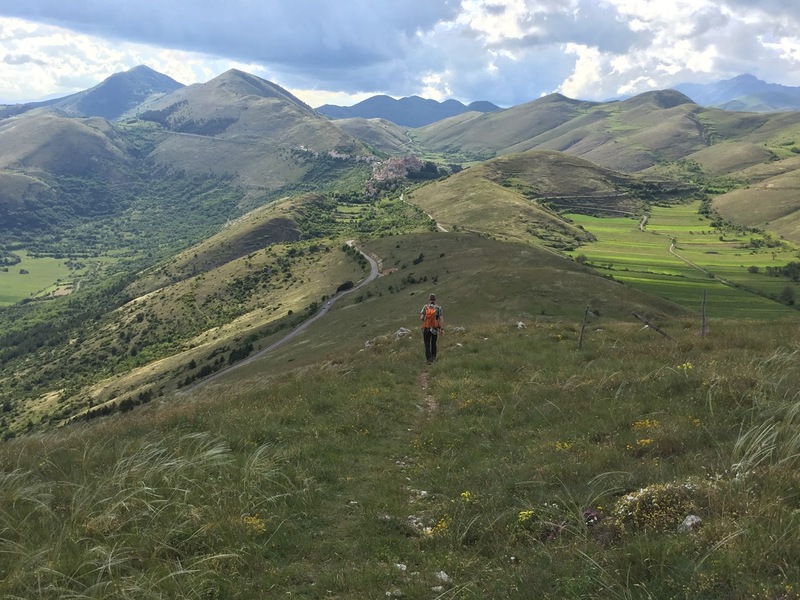 Views of the Monte Bolza ridge hike. 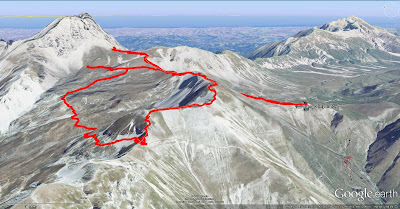 We started out thinking we’d follow the advice in WALK 12 Monte Bolza Ridge [Haines, Stuart; Walking in Abruzzo (Cicerone Guides)], which suggests starting near Ristoro Giuliante and Ristoro Mucciante on Strada Statale 17bis. 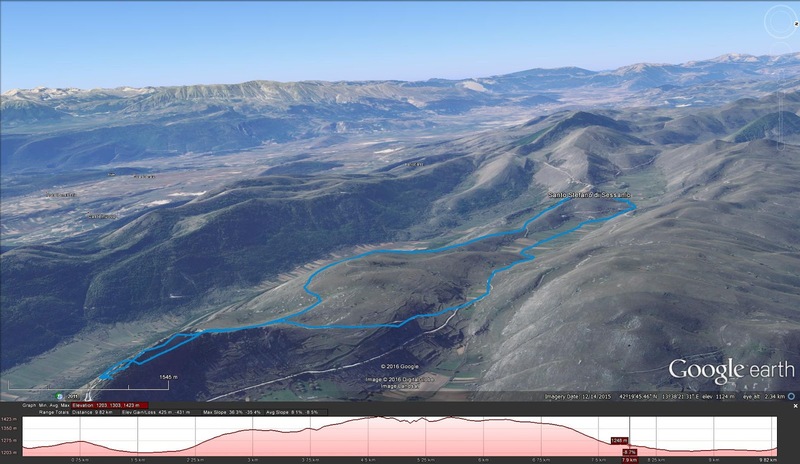 But, we saw another reference for the hike and decided to start on the north side of the town of Castel del Monte. 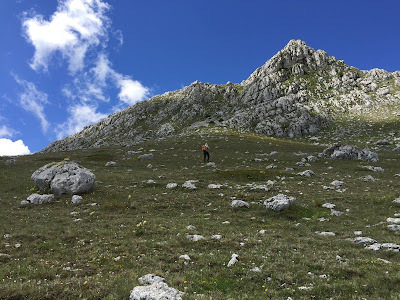 Picking up the trail north wasn’t too bad, but just below M. Bolza, we lost it and couldn’t see how to get to the ridge. So we made our own way carefully. 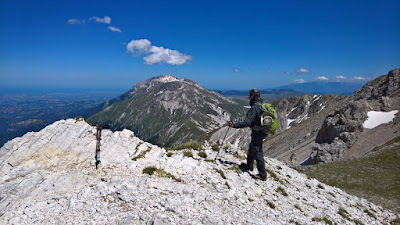 We walked the ridge from M. Bolza to Cima di Monte Bolza, going in a clockwise direction to make a loop. 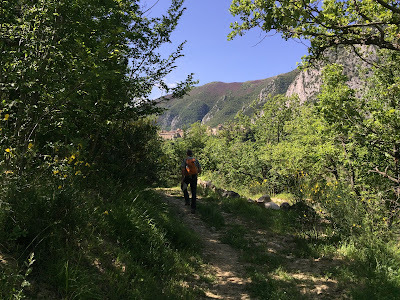 We decided to not descend too low on our way back to the starting point and therefore missed the Canyon della Valianara. Left: An ominous start to the hike; Center: Skies clear revealing the plain of Campo Imperatore. 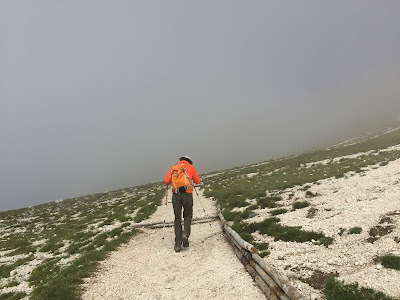 ; Right: Approaching Rifugio Duca degli Abruzzi. 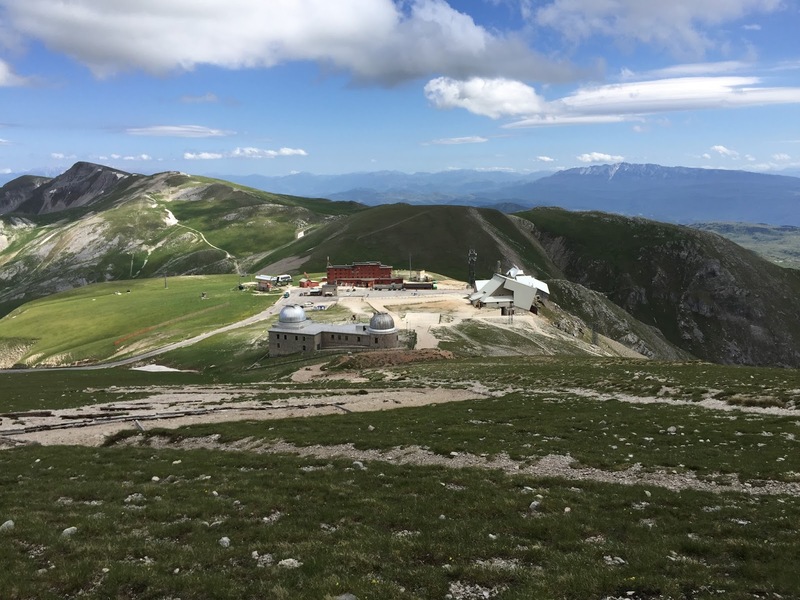 Left: A hearty lunch at Duca degli Abruzzi; Center: View over Rifugio Campo Imperatore from the trail; Right: Last bit of trail before dropping down on to Rifugio Campo Imperatore. 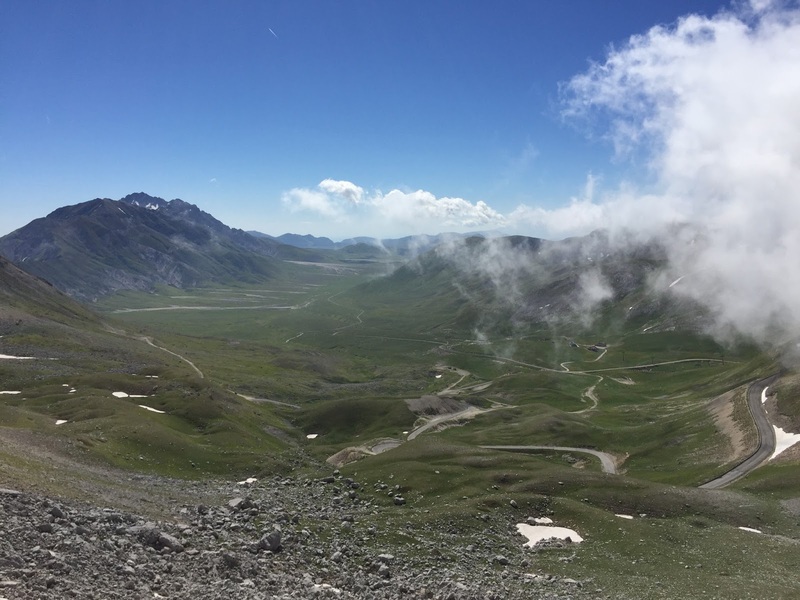 Truth be told: we had hoped to get to see the Calderone Glacier. 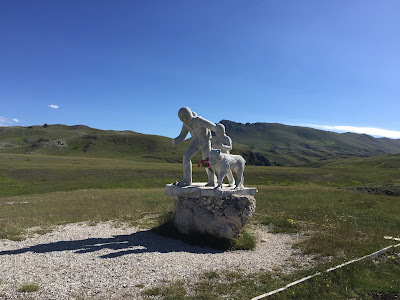 In fact, that was the original inspiration for the trip to Abruzzo. But sometimes, you just have to let things go and move on. It wasn’t in the cards for us today to see the glacier, and perhaps never. 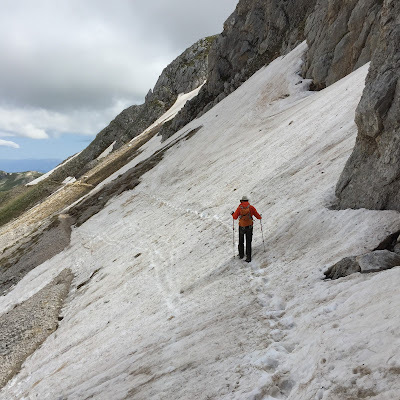 The weather was perfect, but the trail (normal route) had a large enough snowfield just below the Sella del Brecciaio that we didn’t dare try to cross it. 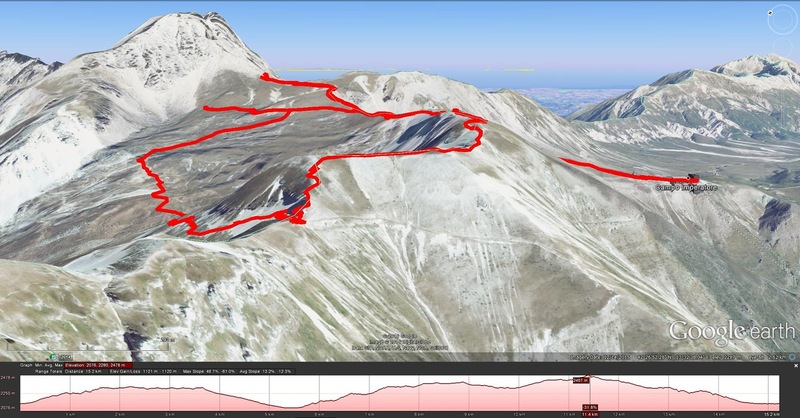 And, the direttissima route to Corno Grande was not for us! We did walk up the first part of the direttissima route (which was easy) and just before it gets hard there is a beautiful view out toward the Adriatic and Pescara. 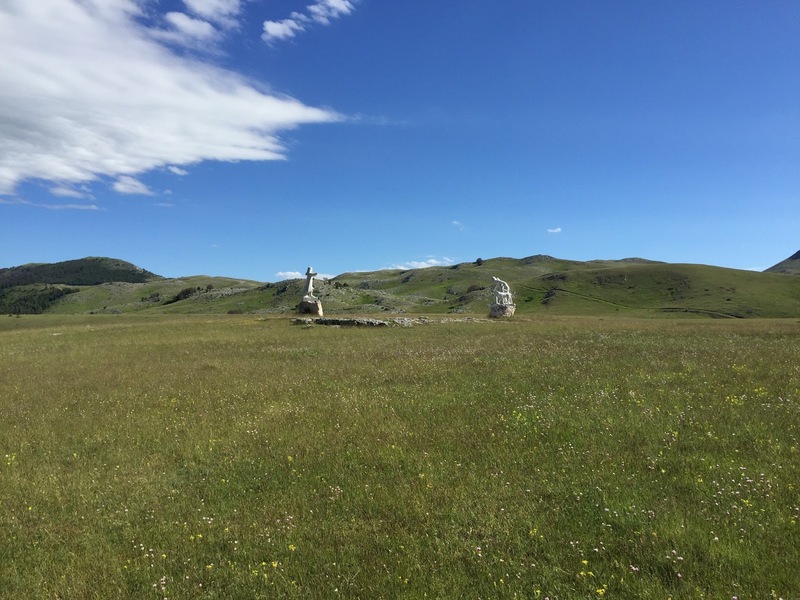 We drove to Campo Imperatore (didn’t take the funivia up because we didn’t know when we would finish), parked, and started our hike. 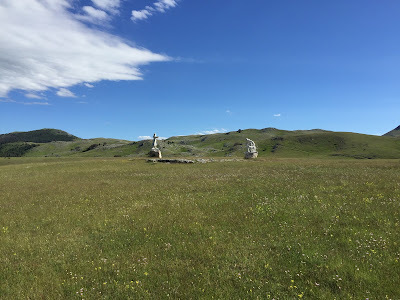 Instead of going up to the glacier, we did a counter-clockwise loop around Campo Pericoli, from Rifugio Campo Imperatore to Rifugio Giuseppe Garibaldi to Passo La Portella to Rifugio Duca degli Abruzzi and back to Campo Imperatore. 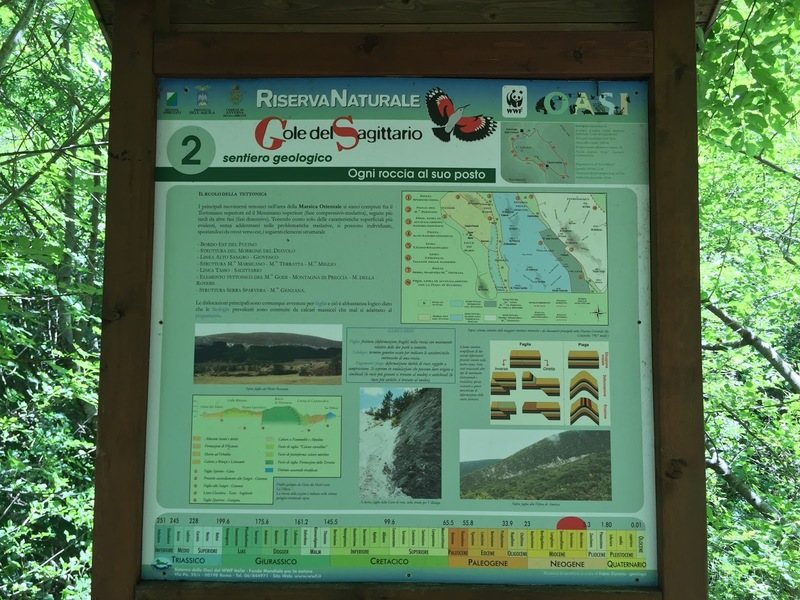 We hiked in the Riserva Naturale Gole del Sagittario, starting and ending in the parking lot for the Sorgenti di Cavuto (below Anversa). We made a clockwise loop that took us to Castrovalva (trail 19) and back to Anversa (trail 18). 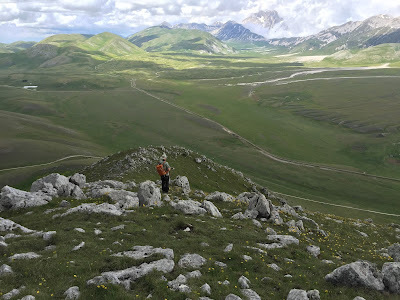 We more or less followed WALK 18 Anversa degli Abruzzi and Castrovalva [Haines, Stuart; Walking in Abruzzo (Cicerone Guides)]. 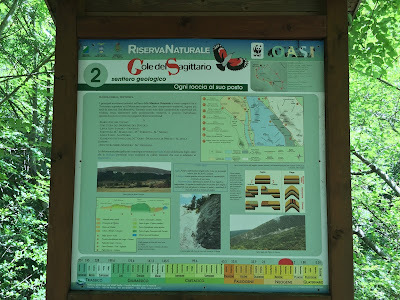 Left: Sign on the Riserva Naturale Gole del Sagittario; Center: Sign on the sentierio geologico; Right: Mungaia con crema di zolle e scaglie di ricotta affumicata – a local pasta dish at La Facciola in Anversa degli Abruzzi. The trail between Anversa degli Abruzzi and Castrovalva.